In 1928 when the Hampshire Road Club was formed, there was only one cycling club in Portsmouth – the Portsmouth North End C.C., other than the Portsmouth D.A. of the Cycling Touring Club. A small number of these C.T.C. members belonged to the Wessex R.C. and competed in the Club’s time trials in the Ringwood area. This group, led by K. Jones, called a meeting at Hollywell, Kingstone Crescent, Portsmouth on 25th February 1928, and the Hampshire Road Club was born. Some 22 cyclists were at this meeting, one of them being A.J. Bishop, the Club’s President until he sadly died in January 1996, having enjoyed 67 years of unbroken membership. Bert will always be remembered for the active role he played in the foundation of the Club and continuous development that took place under his leadership. Bert’s wife ‘Bubbles’ died shortly before him and together they formed a lifelong partnership to help and assist all club members, old and new. The “raison d’etre” of the Club was, and always has been, the promotion of time trials for (at first) members of the Cycling Touring Club, and since 1953, for all cyclists. Although other aspects of cycle racing (track and road) have been added to the Club’s programme over the decades. The long distance time trial had been the Club’s greatest strength. Tandem racing was another favourite pursuit of the H.R.C. 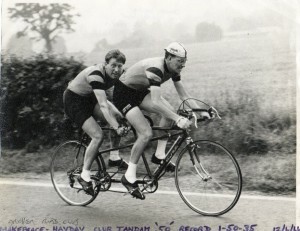 The tandem 50 and 100 miles records put up in the “Thirties” stood until the “Sixties” before being lowered by D. Hayday and R. Makepeace. During the momentous war years of 1935-45, the Club maintained a limited programme of events, although all other local clubs’ activities had virtually ceased. Those terrible times took a grievous toll of our members. M. McNeille, V. Lepora, I. Dexter, H. Sparshatt, F. Few, F. Little, B. Wareham and P. Rogers all losing their lives on active service. Their names live on forever on the Memorial Shield and the McNeille Trophy which are competed for at 50 miles and around Hampshire each year. Following the end of hostilities, the Club took a very full part in the East Hants Time Trials Combine with other local clubs. For three years a successful programme of events was fulfilled. In 1948 the Club again started promoting its own full programme and has gone from strength to strength each year. Membership increased and also the standard and quality of the members’ performance. Poole “12 Hours” wins, by W. Vetcher and R. Geere. An attempt on the R.R.A. Record for Tricycles from Edinburgh to York by Alan Jones – albeit unsuccessful. Southern Road Records by Alan Jones and Graham Jenkins at 25, 50, 100 miles and 12 hours – all on tricycles. In the South DC Best All Rounder competition, the Club won the first team place on 12 occasions, and the individual winner in 1978 by Robin Makepeace. Runners up in 1980 were Pete Pickers in the men’s competition and Barbara Makepeace in the Ladies. In 1984 Shirley Cobley won the Ladies Competition. Howard Long, Steve Skinner and Reg Pettit won the first team prize in 1987. In 1995 & 1996 Richard Parker won the Sussex C.A. Veterans awards at 25, 50 & 100 miles. In 1995 Alun Tribe was the Track League Junior Champion with Mark Lewis as the Juvenile Champion. Mark continued his success by winning the Wessex Juvenile road race championships. In 1996 our youngsters dominated the Track League again with Derek Morley winning the Juvenile title. At road and circuit racing David Tribe became the overall winner of the Wessex Juvenile Championships. In September 1999 father and son partnership Alan and Oliver Jones broke the National Tandem Trike Competition Record with a time of 19m 55secs. Every successful Club must have enthusiastic and good officials, and the H.R.C. has never lacked these. Five Presidents – Claud Pearce 1928-40, Bert Hewlett 1940-48, Bert Bishop 1948-1996 who was elected Life President in 1986, George Davis 1996-98, and Brian Hall 1999-2000. Shirley Cobley was elected in 2001, Robin Woodcock was in office during 2003-4, Richard Parker from 2005-6, Peter Dawson in 2007-8 and Peter Courtnell during 2009-10. Our current President is Chris McGuire. Bert Bishop was the Chairman of the South D.C. of the R.T.T.C. from 1943 to 1969, and another Hampshire R.C. man had the honour of that office, Bill Vetcher from 1977 to 1981. Joan Price was Chairwoman from 1994-2004. Bert Kath & Dave wait for the riders. Our Chief Timekeepers have all been long serving members: Sidney Blamey from 1938 to 1952, the late Jack Hopkins 1953 to 1974, Vince Lowman 1974 to 1979, George Davis 1986-2005. 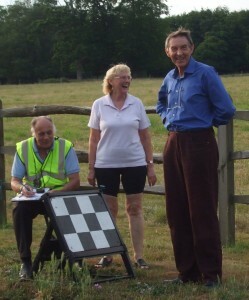 Our current timekeepers are Bert Nancarrow, Kath Whitmore and Gerry Oliver. Our General Secretaries have been many: W. Green 1928-29, K. Jones 1930-35, D. Fry 1936, P. Rogers 1937 (part), A. Bishop 1937-47, S. Peters 1948, E. Shervell 1949, L. Jarvis 1950-51, S. Goldring 1953-56 and 1960-61, J. West 1957, J. Hopkins 1958-59, A. Nancarrow 1961-62, A. Jones 1962-66, W. Vetcher 1967-68 and 1972-74, V. Lowman 1969-71, G. Coulson 1975-76, A. Baker 1977-78, P. Smith 1979, Mrs T. Vetcher 1980, G.R. Cooper 1981-82, A. Hunt 1983-85, P. Orchard 1986-87, L. Pither 1988-2009, Chris McGuire 2010-. 2003 was a special year for the club as it celebrated its 75th anniversary. In a brilliant 2004 season Oliver Jones broke club records for 10, 25, 30, 50 and 100 miles, winning 2 open events during that year. In 2005 he improved the records at 25 and 30 miles, the 12 hour club record and won 6 open events. 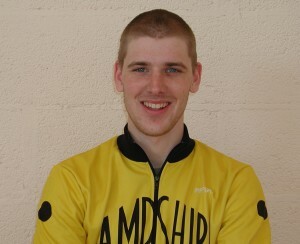 He also achieved 3rd place in the National 12 hour championships and was 4th overall in the national BBAR competition. 2012 saw a well-earned team win in the Portsdown Time Trial League: in fact, the club dominated the League with Andy Langdown winning the Overall Trophy, Gary Ferrett the Veterans’ Trophy, Den Tapping the Senior Vets’ Trophy and Bob Crabtree the Junior Trophy. The trio of Andy Langdown, John Banham & Hamish Walker won the team prize at the HRC Open 10 in April and longstanding club records were broken for the Team in 50 and 25 miles. A strong contingent made the trip to the Duo Normand in September where HRC rider Andy Langdown paired with Shaun Smart (Southdown Velo) placed a respectable 2nd in the Unlicensed Category. 2013 saw the club retain the team first place in the Portsmouth Time Trial League, but also shared the first position with Southdown Velo. Andy Langdown retained the Overall Trophy. In the Duo 2013 Andy Langdown along with team member Dave Dalton (Fareham Wheelers CC) went one better than 2012 and won the Corporate Category appearing on the winner’s podium in Marigny. At the end of 2013 the men’s 10, 25 and 50 mile team records were broken (again) and the individual 25 mile record was lowered to 50.06s by Andy Langdown, who also won the Wessex VTTA 25 mile trophy along with his first Open event. The HRC won the 2013 South DC Best All Rounder team event. 6 Finally, in August 2013 the HRC held a Track Day at the Mountbatten Centre. 14 new track records were established using road (gears) bikes with Andy Langdown setting a club Hour Record with a distance of 27.916 miles. 2014 finished with the 10, 25, 50, and now also 100 mile team records all broken, and a Hampshire Road Club team win in the Duo Normand with newcomer Tom Pritchard riding with Andy Langdown. The HRC won the 2014 South DC BAR team event again. In 2015 the Men’s team 10m and 25m team records were again broken and the 2015 PTTL competition was again won by the HRC. The Clonmore Trophy was also won in 2015. And with the last pedal rev of the 2015 season Bob Crabtree broke the Hill Climb Men’s record. In 2016 Julian Middlewick broke the 12hr time trial record adding another 10 miles to the record which had been held since 2003. With the Portsmouth track opening again, a track day for geared bikes was held, the first time since 2013, and a clutch of new records have been set. Finally, the Hill Climb record was again broken for 2016, this time it was Tom Pritchard. In addition to above, there are many more Club members doing the countless jobs that have to be done in a thriving and successful Club, and to all those unnamed, the Club sincerely thanks you all for your unselfish work.